This scene shows the bloody confrontation between Māori and Abel Tasman's men in Golden Bay in December 1642. 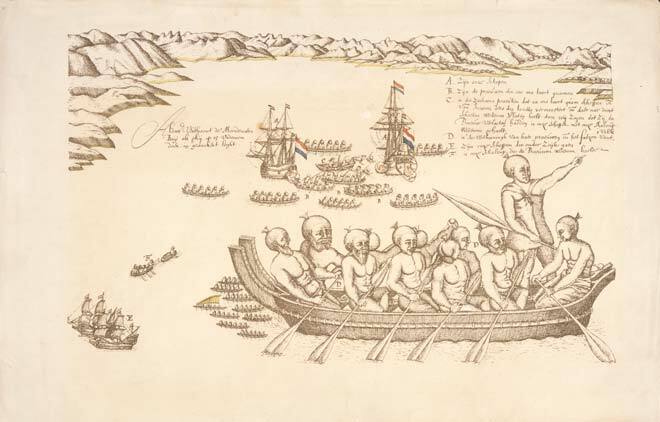 Māori in canoes rammed one of the small Dutch boats that was passing between Tasman's two ships, killing four sailors. A shot fired in retaliation hit one Māori man, but it is not clear whether he was killed. The Dutch called the bay 'Murderers' Bay' after the incident, which helped establish a view of Māori as an aggressive people.